The process is easy. While the connection could be done without plowing an 1/8″-deep groove, it’s easier to do so and the groove adds another detail to your work. 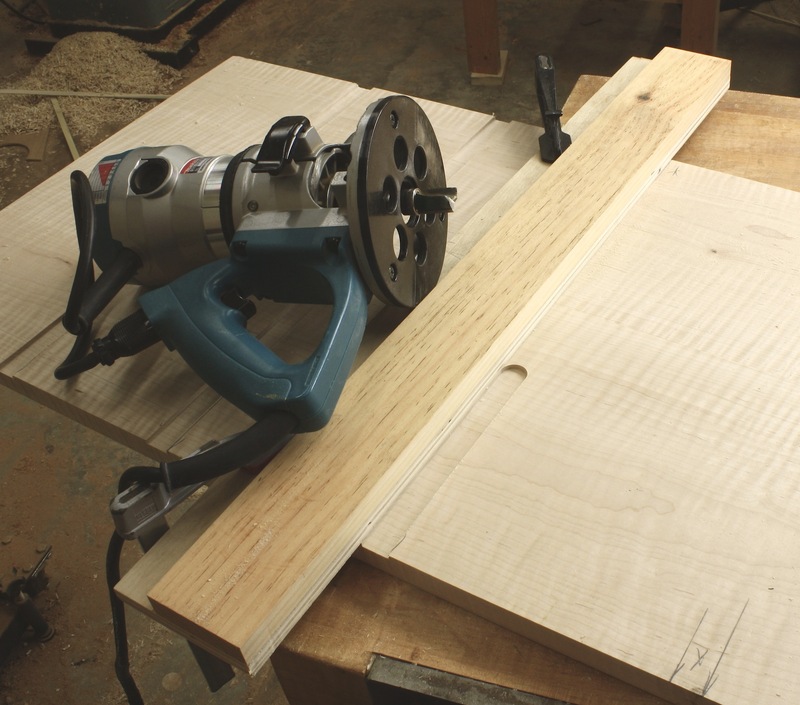 Step #1 is to rout the groove – align a straightedge to your project, then run a router and 3/4″ top-mount bearing router bit along its length as the bearing rides your straightedge. The width of the groove has to match the thickness of your drawer blades. Step #2 is to form the dovetail on the ends of your blades. The length of the dovetail – how high you need to raise your router bit – is equal to the thickness of the material remaining after the groove is cut. If you’re using 3/4″-thick material, after the 1/8″ groove you have 5/8″ of thickness remaining. For me this is a bit of work completed at the router table. Set the height of the bit then adjust the fence so its aligned with the router bit exactly at the table’s top edge. This takes advantage of the entire thickness of your blade – if you’re slightly thinner after your cut, that’s OK, but do not leave a flat on the edge of the dovetail. (Notice the solid push block used to guide the tall drawer divider through the cut.) After you have the dovetail ends created, cut away the back edge leaving a 1″-wide dovetail – trim the dovetail away flush with the square shoulder on your blade. 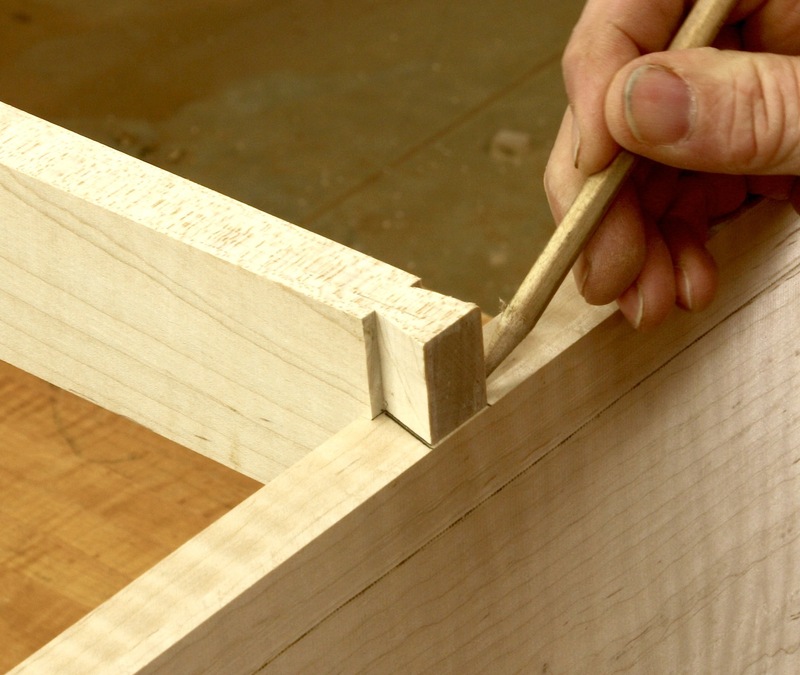 Step#3 is to transfer the dovetail profile onto your case side. As you can see in the photo, the blade slips into the groove and the trimmed dovetail sits tight to the case side. Using a sharp pencil, transfer the profile. Nothing fancy here. No special details to share. Simply install the blades into position then draw the lines. Bingo. Step #4 is to square the layout lines down the case side 1″ (matching the dovetail width), then draw a straight line setting the bottom of the socket. It’s time to define the socket. This is where your ability to saw comes into play. Cut the two sides of your layout down to the inch mark. Follow both lines as you saw. After you’ve established the socket’s outer edges, make a few additional saw cuts between the lines – the more kerfs you have, the easier the next couple steps become and the cleaner your socket will be to work. Step#5 is to break out the thin pieces of wood that fill your socket. You can jam a chisel into the slots, or if they’re thin enough, you can break the pieces out with your fingers. The neat things is that when they break – due to the grain orientation – the slivers break flush with the bottom edge of the socket. (Sometimes they do break slightly above the line.) With the pieces out of the way, pare the socket bottom so it’s smooth and level. Make sure the socket is level from outside to inside. And it wouldn’t hurt to slope a bit toward the inside – that guarantees you’ll have a tight fit on the exterior of your case. The last step is to fit the blade’s dovetail into the socket. If you’ve sawn to the layout lines and trimmed the socket even at the bottom, your blades should fit easily. Brush glue onto the dovetail and into the socket (the best glue surface is the flat-grain to flat-grain connection at the bottom of the socket), then drive the workpiece home. 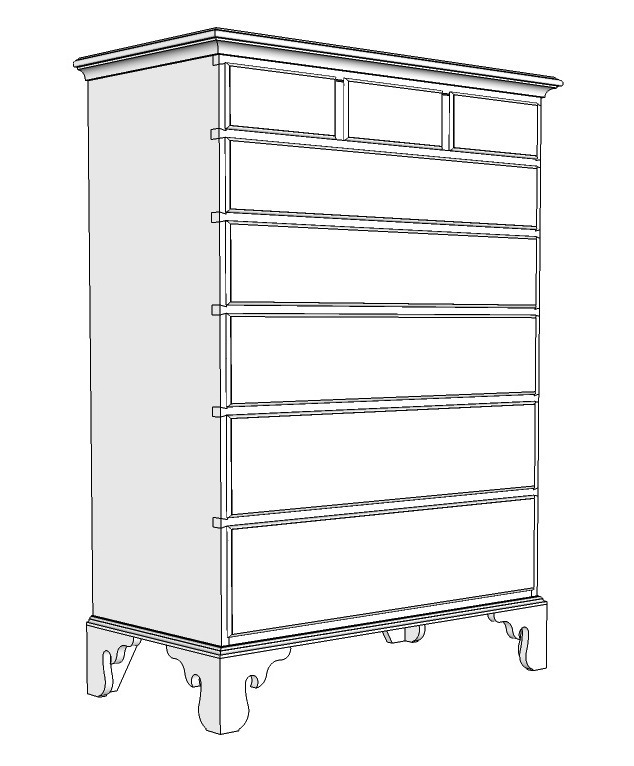 By the way, don’t forget to repeat these steps twice for each drawer blade or divider. Test-fits are terrible with only one socket cut. 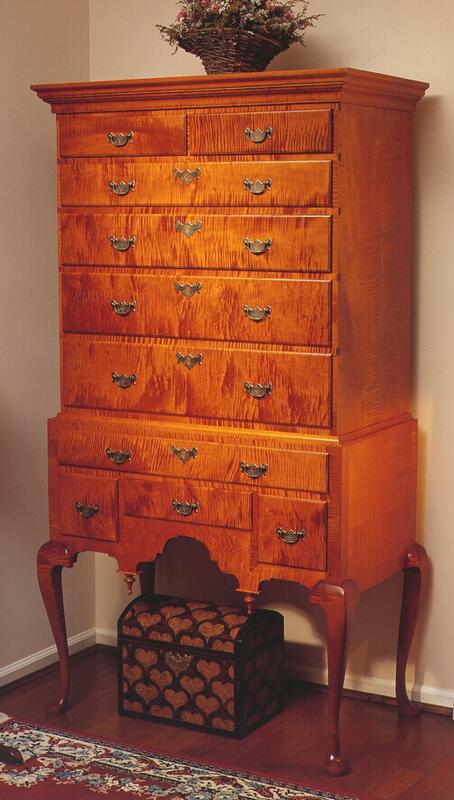 I’m not going to show you a finished shot of the chest of drawers – for that you’re going to have to wait until the issue is sent – but I will show you a photo of the highboy mentioned above. In fact, if you’re so inclined to want to see this process in action, I have a full-length DVD on building the Moses Bayley chest. You can purchase a copy here.